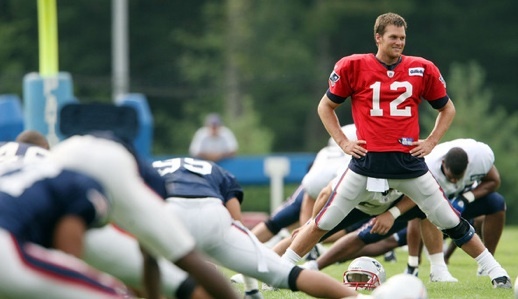 Tom Brady has visibly slowed down last season but it doesn’t mean that the Patriots aren’t the best in their division. Despite Brady on the downside of his career, New England still have Randy Moss, Wes Walker, a top-notch offensive line and a top ten defense. The Dolphins surprisingly have one of the best run-block lines in the league. Imagine if the duo of Ricky Williams and Ronnie Brown were in their primes – Miami would be the best rushing team in the league. Mark Sanchez had a solid rookie season and the Jets made the playoffs. Even if it was Rex Ryan’s defense (and crying) that led the Jets to the postseason, Sanchez deserves some credit for not throwing the ball away often. Do Broncos have depth at QB position, or are they just dense? QB Trent Edwards made the most out of his offensive line by winning six games but RBs Fred Jackson and Marshawn Lynch can be the difference makers that may help the Bills this season. The Steelers are still the top team in their division even if they didn’t make the playoffs last season. Ben Roethlisberger’s absence will affect Pittsburgh in the start of the season but the team’s defense will keep them in the thick of things. The Bengals had a great season last year and return with a loaded offense. Their defense is good but still can’t make stops at crucial moments – the only thing stopping them from getting to the next level. The Ravens picked up Anquan Boldin and Donte Stallworth to help out Joe Flacco on offense. Pair that with a tested defense and you have a formula for success. The Browns suffer at the QB and RB positions and there’s no fixture in sight. The Colts are the favorites to win the AFC again but if they don’t get production out of their running backs they’ll end up just like last year – ringless. The Texans are one up on the Titans mainly because of Matt Schaub’s experience over Vince Young’s inconsistent career. 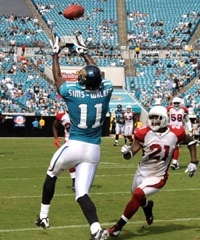 Jaguars Receiver Sims-Walker, a star in our firmament. Vince Young’s performance last season, in which he led the Titans to an 8-2 record once he took the snaps, is promising. Oh and RB Chris Jackson is the best in the league. Yes even better than Adrian Peterson. WR Mike Sims-Walker and RB Maurice Jones-Drew are the only good things going on down in Jacksonville. San Diego fell short last year and the departure of the quick declining LaDainian Tomlinson doesn’t help their needs in the back field. Still, the Chargers are still good enough to make it to the Super Bowl. 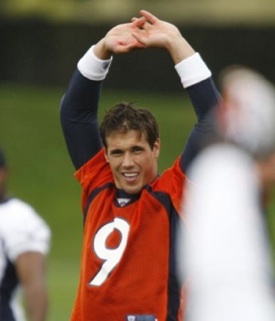 Denver has one of the worst trios of QBs in history: Kyle Orton, Brady Quinn, and Tim Tebow. It’s a good thing they still have Knowshon Moreno or else they’d be this year’s Detroit Lions. Chiefs have to improve their defense because it looks like their offense is going to take a while to improve. It’s great that they got rid of JaMarcus Russell. It’s always good when you release a 300-pound, underachieving former number one pick.